We have this freezer in our kitchen to hold the frozen foods that we buy and the frozen meat we use daily. It is very roomy inside and hold a lot of food. We have three chest freezers in our garage, but we wanted to have an upright freezer in our kitchen so we wouldn't have to run out to the garage every time we needed a frozen food item. 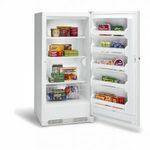 We keep this stocked with frozen pizzas, veggies, fruits, ice cream and lots of other frozen items. This freezer has an average price, but it seems to be very good quality. There are several shelves inside and drawer space as well. It is easy to keep thing organized so we can quickly locate whatever food we are searching for. It actually matches our regular refrigerator pretty well. The motor gets a little loud sometimes, but all of the bedrooms and family room is far enough away that it isn't an issue. 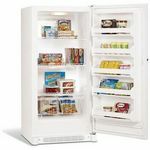 if you are in need of an upright freezer for your home, you really should check this one out. it is an excellent one! LOVE LOVE LOVE this freezer! We are a family of four and always had a cram packed freezer/refrigerator and I hated it. I very much wanted to save money for my family by doing more freezer cooking, stocking up on sales for meat, freezing fruits and veggies that were in season, etc. It was so difficult to find anything in our small refrigerator freezer that food often spoiled and went bad. I have owned this upright freezer for a little over a year and couldn't be happier! It stays neat and organized, I have so much more room I am able to do all of the things mentioned above it it really is saving me money! We keep the freezer in a utility room off the kitchen so any noise isn't an issue. I have read other reviews were people thought it was a little noisy. Not an issue for my family. For the price you are getting a great freezer! 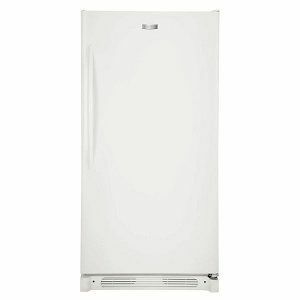 This is my first stand alone freezer so I don't have much to compare it to, but I would definitely recommend! I really love my freezer! We just bought this Fridgidaire upright deep freezer about five months ago. We bought it to replace our older Fridgidaire chest freezer. The old one did not break. We actually gave it to my mother in law, because another new freezer we bought her broke within two months, so we gave her our old one instead. 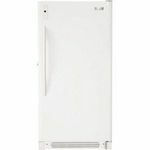 The reason I mention this is because I really trust the Fridgidaire name, especially when it comes to freezer for long lasting durability. My whole kitchen it full of their products, and it is true quality and affordability. The upright it so nice because you can store a ton of food - make ahead meals, ice cream/desserts, meats, and so much more. 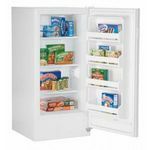 I freeze everything in this and it's easy because all of the shelves and drawer, and storage in the door make it easy to find everything and categorize all of the items in your freezer. Did you know you can even keep a running inventory on the outside of your freezer door with a dry erase marker? Design I love how it takes up less space in my garage than the chest freezer did. It is just my husband, myself, and our toddler in the house, but I do a lot of freezer cooking to save time during the week, and I like to stock up on items during sales. So our freezer probably gets more use than the average household! This freezer has been a great choice for us. Truthfully I would have liked something a little larger, but it was going in our basement and the stairs have a turn in them. This was the largest freezer we were certain would fit down, and it's working very well. It is a little loud when the motor is running. If we spent time watching tv in our basement I can see that it might be a problem, but as it is we don't go down there much. This is a quality freezer for a decent price. My husband and I bought this freezer when while I was pregnant with our first child a couple of years ago. We needed a freezer where we can store extra food and my breastmilk to deep freezing temperature. This freezer has done a great job thus this far. Has survived many times in the past in keeping our food frozen throughout power outages and our food never got spoiled (just don't open it too much during that time). The size of the freezer is just right that we are able to still fit two of our vehicles (a regular size sedan and SUV) in the garage with no problem opening the freezer door. I am freezing again my milk for our 2nd child and happy that I have a durable appliance that does it's job. We bought this freezer with money we received from our wedding and we couldn't be happier with this item. It has plenty of space with several tiers of shelving, a large bin drawer at the bottom and multiple built in shelves in the door. It is fairly energy efficient and doesn't take up a large footprint which is good for us because we placed it in our garge. Also, it is quiet and keeps items cold. I would consider it a good entry level freezer for a small family from 2-4 people.